Puts the "War" in 'Star Wars.' Made for 'Star Wars' fans obviously, but there's plenty of fat to chew on for everyone else. Rated PG-13 for extended sequences of sci-fi violence and action. Are we already getting spoiled by Lucasfilm with our second Star Wars film in as many years? Hard to believe that it was 33 years between Return of the Jedi and The Force Awakens. Now, there are planned Star Wars features for years to come. Is the world going to lose interest in a typical case of sequelitis? Not if Disney’s band of filmmakers have anything to do with it. It was a risky venture announcing a spin-off film, let alone another prequel. And yet Rogue One fits spectacularly into the Star Wars canon as much as anything that’s happened before or after. Galen Erso (Mads Mikkelsen) is trying to keep a low profile as a farmer with his wife Lyra (Valene Kane) and their daughter Jyn (Beau and Dolly Gadsdon). The Empire’s Orson Krennic (Ben Mendelsohn) soon arrives to herd them up, but not before Lyra gets herself killed and Jyn goes into hiding. 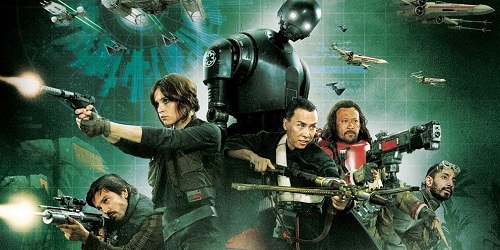 Jyn is soon rescued by Saw Gerrera (Forest Whitaker) and we skip ahead to the film’s present day. Jyn is now a rebel without a cause, but after being captured by General Draven (Alistair Petrie), she finds herself embroiled in a plan to steal the plans to Darth Vader’s (voiced by James Earl Jones) Death Star. Rogue One is mighty busy — but the time doesn’t always fly by. There is a sluggish pace right in the middle of the film where it should be gaining momentum and an emotional core. You can’t blame director Gareth Edwards (Godzilla) for trying. It’s obvious to tell that screenwriters Chris Weitz (Antz, About a Boy, Cinderella) and Tony Gilroy (The Bourne Legacy, Michael Clayton) didn’t quite collaborate. (It’s obvious in a film’s credits when they’re not named together with an ampersand.) Weitz probably focused most of his attention on characters and dialogue, while Gilroy lent a hand at maximizing the action. At least cinematographer Greig Fraser keeps everything in focus and adds some geography so we know what’s going on. The cast is fantastic, with Jones in particular showing she can not only lead her motley crew, but carry the film all on her own. She never falters and gives the depth her character needs to make us care about Jyn’s plight. Composer Michael Giacchino was handed the reigns to the score and I can’t think of anyone else who could fill John Williams’ shoes. I’ve been calling him the next John Williams for years so it comes as no surprise to find him delivering a separate, but familiar score. There are so many positives to Rogue One—yet that would venture into spoiler territory. It does run a tad long, and there are some questionable instances of CGI. It’s most interesting to see Edwards deliver such an exciting Star Wars entry with next to no use of the Force. Yes, we all know Darth Vader is making a return, but aside from his two scenes, there’s almost no Force whatsoever. And that’s where Rogue One truly succeeds, in giving a behind the scenes peek at the rest of the Rebellion in action. It may take a second or third viewing to truly appreciate Rogue One. It’s not like myself, or any other self respecting Star Wars won’t be doing just that. And here’s hoping Lucasfilm, Disney, and Kathleen Kennedy can all continue holding the series up to the high standards time has set upon the series. May the Force be with them, and so far, so good.